Give the gift of wellness and relaxation with a massage gift card to Moyer Total Wellness. It’s the perfect gift for birthdays, anniversaries, holidays, mother’s day, or just because. Whatever the occasion, you can never go wrong with a massage. Interested in a chiropractic care or acupuncture gift card instead? We can do those too. Wellness is the perfect gift to share with your friends and family. You can purchase a massage gift card for any dollar amount through our online store. There is an easy to use ‘template’ in which you can create an actual gift card to give (or email) as a gift to someone else. Please make sure you are on the “Gift Cards” tab of our online store as the “Services” tab will not give you a gift certificate (if you accidentally do this, just give us a call and we can help you out). You can also call 303.756.9355 to purchase any massage gift card over the phone. When you do this we can either email you a gift certificate or send one in the mail directly to the recipient. Additionally, you can stop by our wellness center anytime during normal business hours to pick one up. 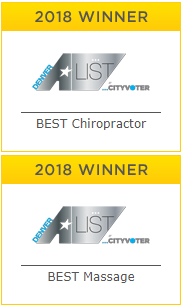 Moyer Total Wellness won “Top Massage in Denver” through 5280 Magazine in 2014 and 2017 and “Best Massage in Denver” through Denver’s A List in 2018, 2012 & 2013 (and Runner-Up in 2011), so you know you are giving a quality massage gift. Massage Gifts are the gift of relaxation. Life can be very stressful, and there is nothing more relaxing than a great massage. Our wellness center is centrally located in Denver, right off the highway (not too close though!). We offer free parking too. Our wellness center is recently remodeled and our massage rooms are up to date with dimmable lighting, volume controls, heated blankets, and plush tables. You really can not go wrong when giving a massage gift card from Moyer Total Wellness.